It’s such an appropriate throwback because it’s when my quilting journey truly began. Although I’ve sewn my whole life, since I was a small girl at the knees of my dressmaker mother, it wasn’t until one of my high-school besties was pregnant with her first bubba that I decided to teach myself to quilt. It’s been so satisfying to discover this quilt again and to recognise that I really am an improv quilter through and through – it’s how I started and how I still work. Even when I’m not improv piecing, I definitely design by improv! I started this quilt with no plan in mind, just a sea theme – it grew from there. I appliquéd some blocks and pieced the rest and then hand quilted bubbles and outlines with stranded embroidery floss… It was a simple start but oh so effective – I enjoyed making this so much, I’ve never stopped! Since making this quilt almost 15 years ago, I’ve learnt so many new skills and techniques but remembering the process of this, the improv design, I feel contented that I’ve remained true to my own creativity (and oh so grateful for all the lessons I’ve learned along the way). The other lovely thing about this one? Until a few days ago, I didn’t have a photo of it. I sent of a quick note to Chookie* and asked if by some chance she had a picture of the quilt somewhere. I never expected her to say that she still had it and that it is still a treasured item in her home. She snapped a quick shot and emailed it to me. That there is the reason I make for people. This quilt, so many years on and so much water under the bridge of our lives, is still valued and valuable. * definitely a strange nickname for a woman I admire for her strength, courage and unbreakable spirit. We lived next door to each other for a few years as teenagers, and she was a stalwart of my teens and twenties and definitely my partner in oh so many crimes (figuratively speaking of course!). Even though we are now, ahem, grown-ups, I still can’t call her anything but this. I’d love to see photos of your first quilt. 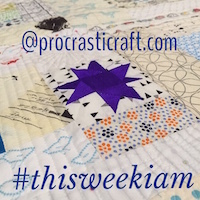 Post them on your blog or over on Instagram with the hashtag #myfirstquilt – let me know in the comments if you’ve blogged it so I can come and have a gander. This entry was posted in Creativity, improv, quilt, quilted, quilting, scrap, scrap quilt and tagged #myfirstquilt, amatuer, applique, baby quilt, quilt, quilted, Quilting on October 16, 2014 by procrasticraft.